(NaturalNews) While holidays provide us with time to relax and eat a bit of junk food it's still important to know what's in the food we're eating. It may seem harmless to have a small slice of pie until you learn just how much fat that one small slice contains. One common apple pie many people reach for is Wal-Mart's double crust apple pie. Just one slice contains 420 calories and 11 grams, or 55 percent, of your daily saturated fat intake. This is an alarmingly high level of saturated fat for just one slice of apple pie. Less than 7 percent of your total daily calories should be saturated fats, as recommended by The American Heart Association; which is about 16 grams of saturated fat a day. According the American Heart Association, saturated fats not only raise your cholesterol levels, they also increase your risk of developing heart disease and stroke. Marie Callender's pies are also a holiday favorite. Their lattice apple pie contains 340 calories per slice. While a slice of this pie is 80 calories less than Wal-Mart's version, there are other factors to seriously consider before taking a bite. This apple pie contains 3 grams of trans fats. Trans fats are artificial man-made fats. According to The American Heart Association, trans fats should account for less than 1 percent of daily calories. That's equal to 20 calories or less than 2 grams a day. Some foods, such as beef, already contain trans fats which are naturally occurring. The amount of naturally occurring trans fats an individual consumes daily already meets the 1 percent recommended by The American Heart Association. This puts the 3 grams per slice in a Marie Callender apple pie well over the limit. There is still not enough information as to how the body processes naturally occurring trans fats. Non-natural occurring trans fats however, are especially bad because the body doesn't know how to process them. According to The American Heart Association, trans fats: raise your bad cholesterol, lower your good cholesterol, increase your risk of heart disease and stroke, and lead to a higher risk of developing type 2 diabetes. Other common holiday foods include hot dogs, soda and popcorn. You may already know these aren't the healthiest foods but let's look at the facts. 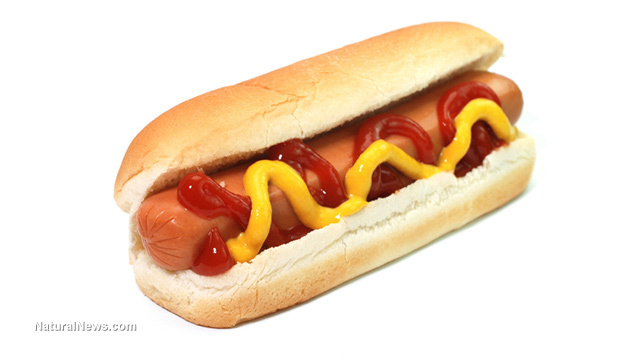 One Ball Park hot dog, one of the most popular and common hot dogs, contains 5 grams of saturated fats and 20 percent of the recommended daily sodium. Pop Secret brand buttered popcorn may taste just like movie popcorn but the down side far outweighs the delicious upside. This popcorn contains 5 grams of trans fat and if that wasn't enough artery-clogging oil for you, it also contains 2.5 grams of saturated fat per 2 tablespoons of unpopped popcorn. Lastly, soda. This aspartame-loaded beverage doesn't contain any fat but did you know that regular consumption of it leads to a fatty liver? In a study by Danish researchers non-diet soda was shown to create a dramatic increase in fat buildup around the liver and skeletal muscles. The study revealed that drinking a regular soda every day for six months led to approximately: 140 percent increase in liver fat, 120 percent increase in skeletal fat, 30 percent increase in triglyceride blood fats and other organ fat, and an 11 percent increase in cholesterol, compared with people who drank water or milk.